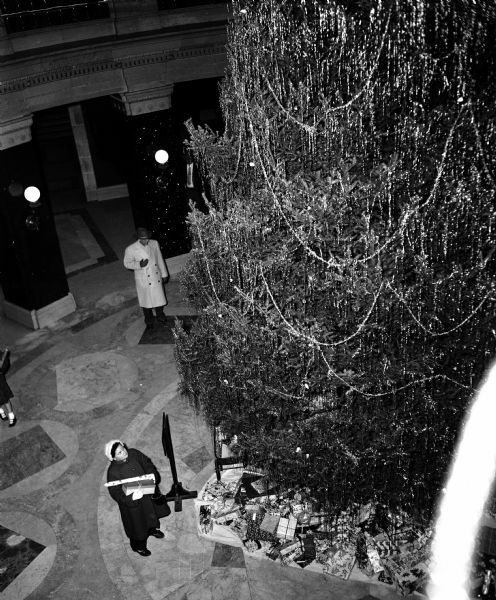 Regina Jean Licari places places a gift under the Yule tree installed in the rotunda of the State Capitol. Gifts placed there were given to residents of the state children's home at Sparta, Northern Colony at Chippewa Falls, and Southern Colony at Union Grove. One of four images. Published in Wisconsin State Journal Dec. 23, 1953.